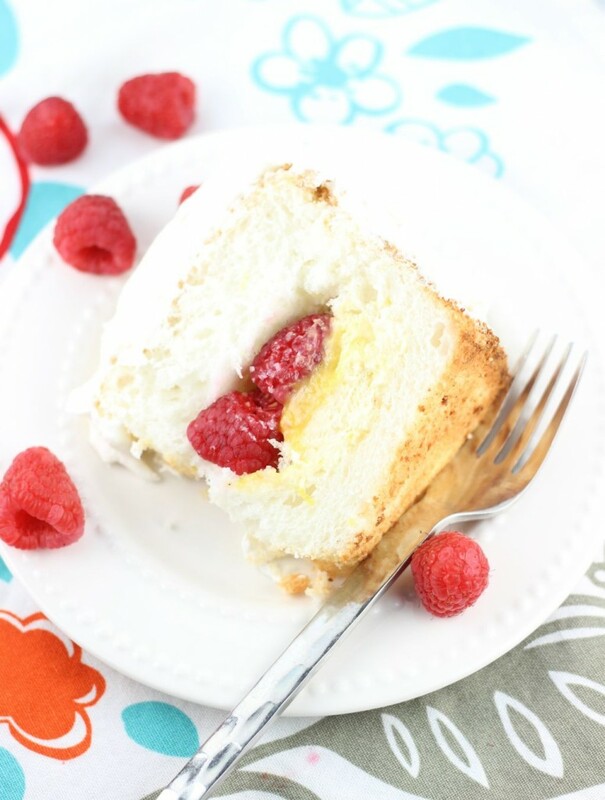 A lemon angel food cake is filled with lemon curd, lemon Mascarpone cream, and fresh raspberries, then topped with mounds of fresh whipped cream! What I’m in the mood for is more of this cake! Sadly, it’s been long gone for weeks, but when it was still kicking, it was irresistible. 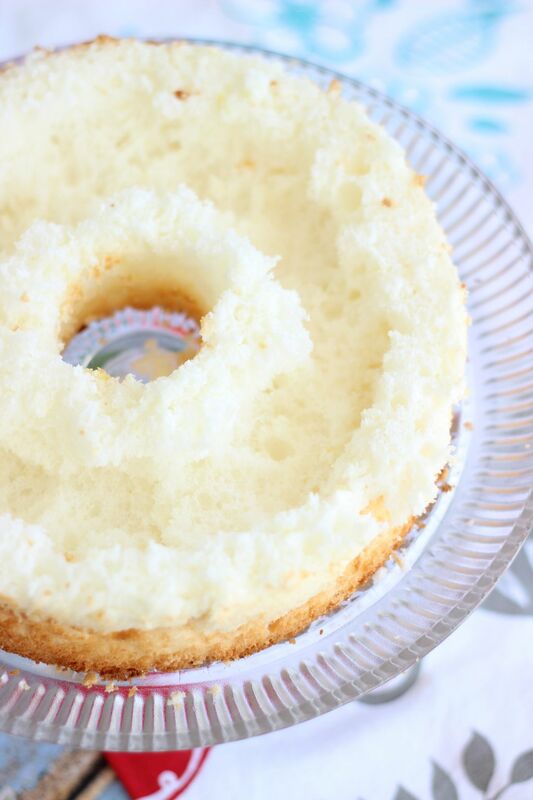 I have a soft spot for Angel Food Cake. My Gma made a lot of it for us over the years. 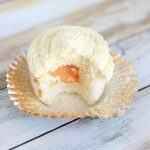 She served it with strawberries and whipped cream, or a thick and unfluffy buttercream, which we love. Sometimes she made both so that we had the option! It’s so fluffy, airy, and spongey, but perfectly sweet. I am always convincing my S.O. 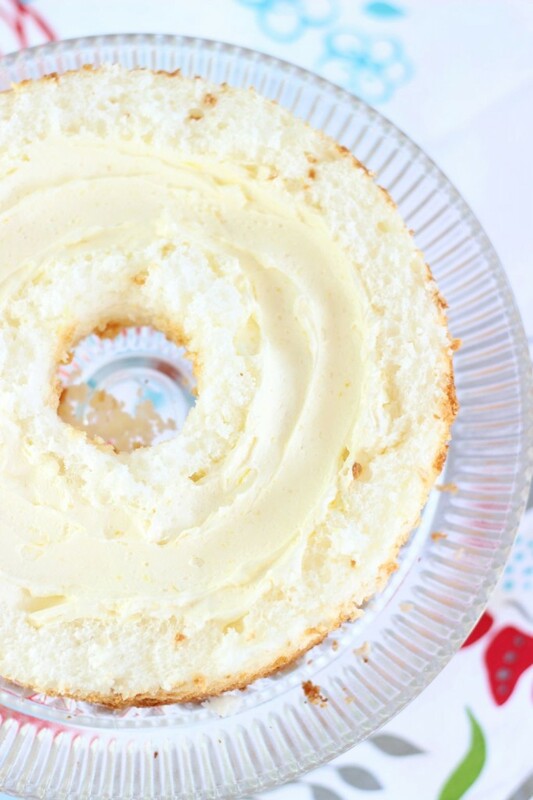 that Angel Food Cake is practically healthy since it’s nearly fat-free. This line of reasoning works. Sure, it’s all sugar, but whatever – it’s also fat-free! Of course, it also depends heavily on what you top it with. 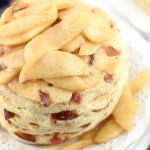 Or in the case of this cake, what you top it with AND fill it with. I was on a curd kick, which I talked about at great length. So many yolks, so little time. Since I had a ton of citrus fruit too, I just couldn’t stop myself. I made batch after batch. Lemon, orange, grapefruit, and lime. With one of the last remaining batches, I decided to tunnel out the middle of an Angel Food Cake, and fill it with lemon curd. Not just any Angel Food Cake though, but a lemon Angel Food Cake that’s been flavored with freshly squeezed lemon juice and lemon zest. Aaaaaah, refreshing lemon zing. A spongey and light lemony cake that’s been filled with luscious, sweet, and tart lemon curd. And on top of that lemon curd is a layer of creamy and sweet Mascarpone that was also spiked with – you guessed it – lemony zing. Then a layer of fresh raspberries. 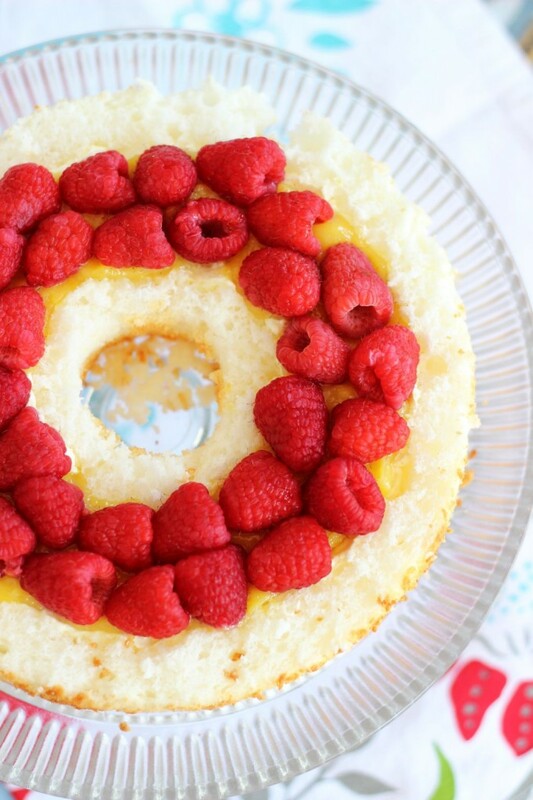 So much lemon and yet just a few rogue raspberries in the middle and on top? Yep, that’s correct. 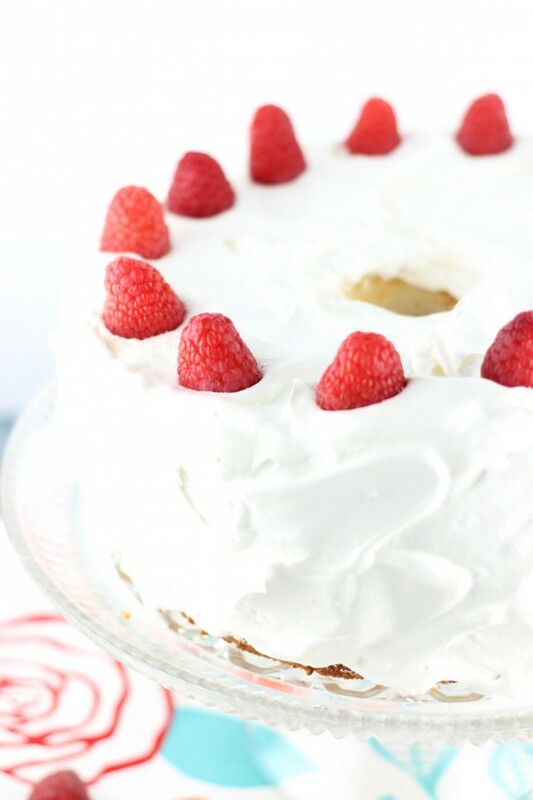 Whole, fresh, ripe, unadulterated raspberries are actually the perfect addition to this cake. PER. FECT. 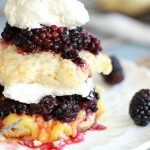 Exactly what it needed.The berries follow right along with the sweet + tart theme of this cake. There’s so much other sweet + tart in this cake that you might think that the last thing it needs is something else sweet + tart, but the juicy berries give everything a boost of freshness. Think about the last time you had raspberry lemonade. It’s a classic! This cake is like that. Maybe I should’ve named it that. 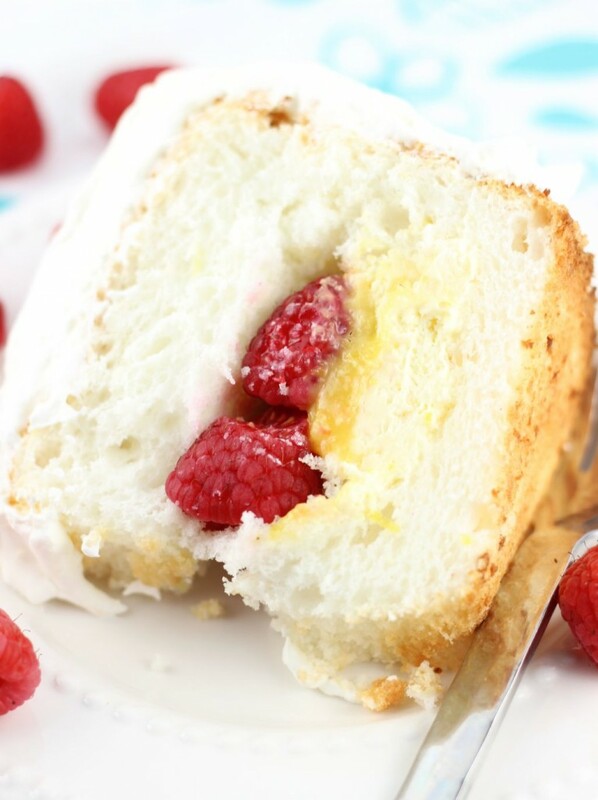 Raspberry Lemonade Angel Food Cake. Oh well. It is all so, so good together. So good that it’s hard for me to find the right words. But there isn’t a thing about this that I would change! In a small bowl, whisk together the egg yolks, lemon zest, lemon juice, sugar and salt. Transfer to a small saucepan. Cook the mixture over low-medium heat, stirring constantly, until it is thick enough to coat the back of a spoon, 3 to 5 minutes. Remove from heat and add the butter. Mix until smooth. Transfer the curd to a small bowl and cover with plastic wrap. Refrigerate until chilled, about 30 minutes. In a large mixing bowl, combine heavy cream and powdered sugar. Beat on high speed until soft peaks form, about 3-5 minutes. Beat in Mascarpone cheese. Mix until smooth. Fold in the 1/3 c. lemon curd. 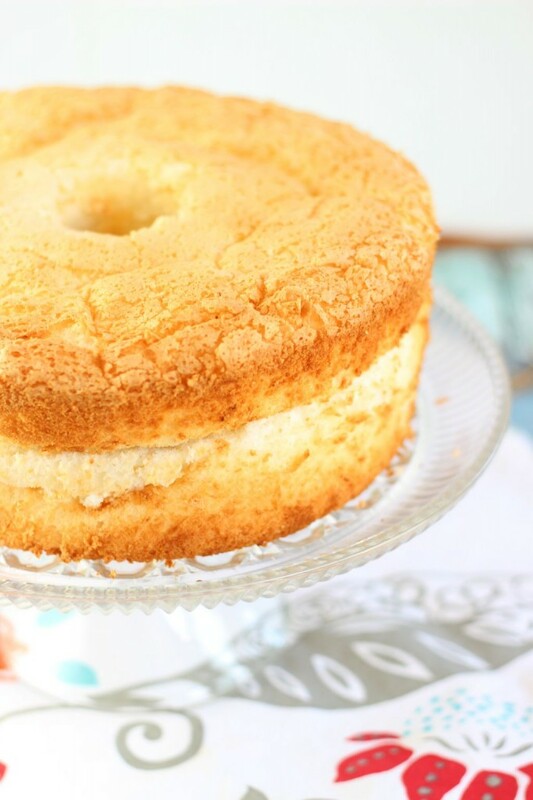 In a large mixing bowl, combine angel food cake mix, lemon juice and zest, and water. Beat until light and fluffy, or about 1 minute. Pour into an ungreased angel food cake pan. Bake at 325 degrees for 35-40 minutes, or until golden brown on top, and a toothpick inserted near the center comes out clean. Invert on a bottle top (or other rack), and cool completely. Run a knife around the edges to loosen the cake, and remove it to a serving plate. Carefully slice the top of the cake off in one piece with a serrated knife, about 1/3 of the way down, or about 1.5 inches from the top. Using your fingers, carefully tear out a tunnel from the bottom part of the cake, leaving about 1-inch shell on all sides and the bottom. Evenly spread the Mascarpone cream mixture into the cake's tunnel. Top the Mascarpone cream evenly with the remaining lemon curd. 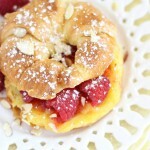 Top the lemon curd with a layer of fresh raspberries, reserving a few for the garnish. Beat on high speed until soft peaks form, 3-5 minutes. "Frost" the cake evenly with the whipped cream, and top with a few fresh raspberries for garnish. This is such a beautiful cake Sarah! Love the filling! I am so excited for this. No, really. Pinning immediately. 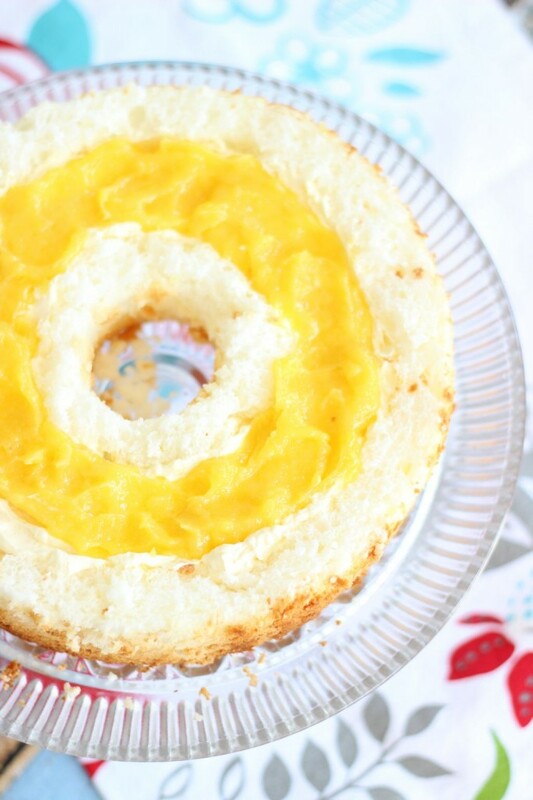 YES lemon curd in angel food cake?! This is genius. Lovely decorating. 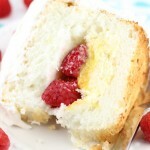 I love how light this is and the lemon mascarpone filling sounds wonderful. This cake is beautiful, Sarah! I’m the same way and have so many recipe photos taken but haven’t had the time (or am too lazy haha) to edit the pics, write the blog post and recipe. 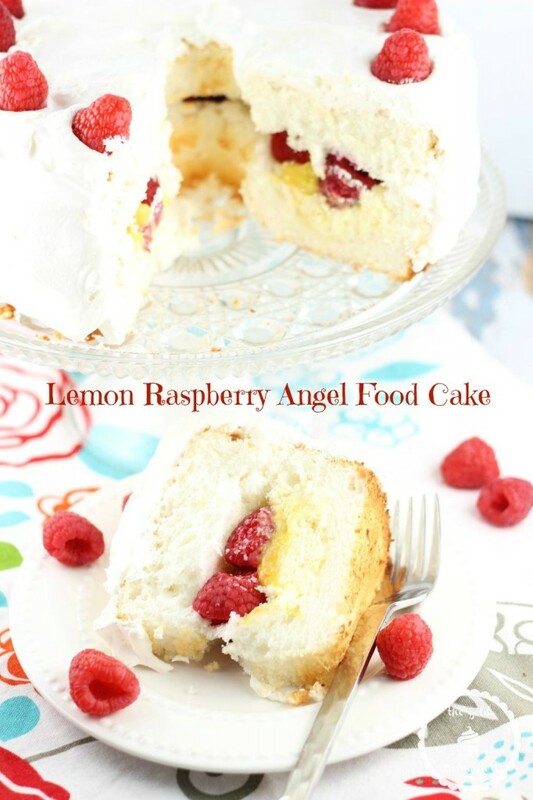 So glad you shared this 🙂 I love angel food cake and the lemon and raspberry combo sounds perfect! I definitely need this in my life!! Sarah, this cake looks amazing! 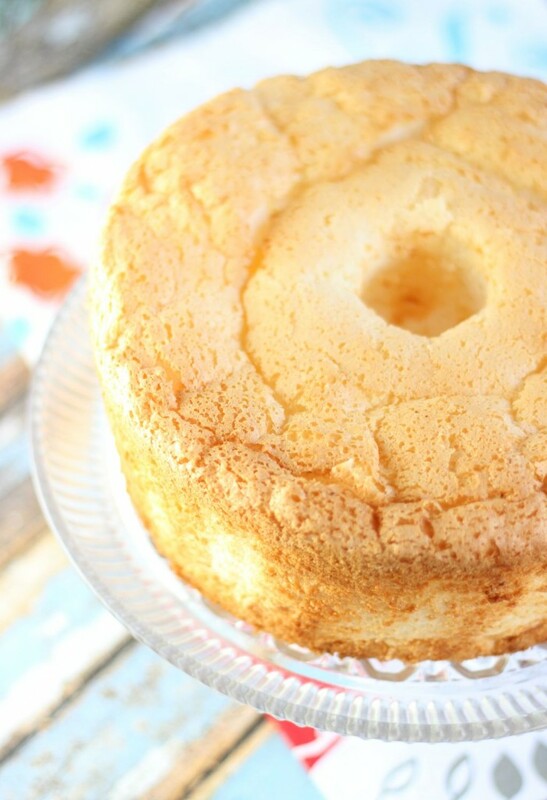 My Gma used to make angel food cake all the time with strawberries and whipped cream lol … it was my Mom’s fav too. Definitely pinning this right now! My Grandma always made strawberry angel food cake too!! Always with strawberries and whipped cream! How funny! Pinned now. Sharing on twitter. 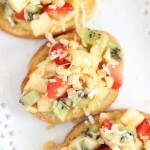 I want to eat this right now! 🙂 Thank you so much for sharing at #HomeMattersParty hope to see you back! Hi just stopping by and letting you know that this awesome post was picked as one of the featured posts on the #HomeMattersParty this week. While you are there make sure to grab the I was featured button for sidebar. Congrats and hope you will link up again.